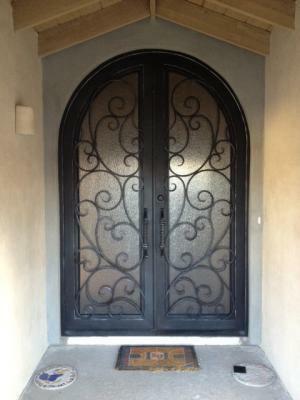 Pictured above is a beautiful and unique iron entry door located in Tempe near Scottsdale and Phoenix, Arizona. This front door perfectly complements this large entry way and creates a grand first impression. This arched entry door was custom built for this customer ensuring that every inch of the iron door was to their liking. Signature Iron Doors is the leading manufacturer of quality custom iron products, creating custom iron front doors, iron garage doors, wrought iron railing and ornamental iron gates. The scroll work on our iron entry doors is hand forged by fire making sure that every door is it's own unique piece of artwork. Click here to visit our website and see the numerous iron products we produce and contact us to see how we can help you transform your old front door or wood garage door into a beautiful piece of forged Iron artwork.